There are life-threatening and underexposed aspects and consequences of the measures to ensure a better environment, such as limiting the emissions of cars. Just ask the owner of the BMW X3 from 2012 with only 120.000 km on the counter. This was, up until the time of stranding, powered by a 3.0-litre six-cylinder common rail engine with code: N57D30B. The problem described in this article is not inherent in the BMW brand or model X3. The milieufenomeen will find more brands and types with both petrol engines as diesel engines. Search this website for more articles about cars and the environment or click here to view all technical articles view. At any time, both the car and the driver and his wife were very convincing faced with the dynamism of the environmental lobby. Driving in the X3 with a corridor of up to 130 kilometers per hour on the highway, they were confronted with a recalcitrant engine, which seriously began to keep to a few meters away, to repel. The only sign of life was the smoke from under the hood came from. Fortunately, was the BMW at that time already on the hard shoulder, because after the turn of the engine it turned out that the car in no way by the rider to move. The selection trade of the automatic transmission in position “P “ to enter and let there not more out of it. This structure may be useful on the hard shoulder, but if applied on a taxiway, I see quite a few pitfalls. After the occupants of the car had left and most of the smoke was gone, could the third ANWB without any problems without the hood open. After the last rookresten were heengezonden, it was visible that the intake manifold is locally extremely high temperatures to process had, and was partly melted. Diagnosis and repair on the spot were not possible, so the car was transferred to a repairman that the manifold has to be developed. 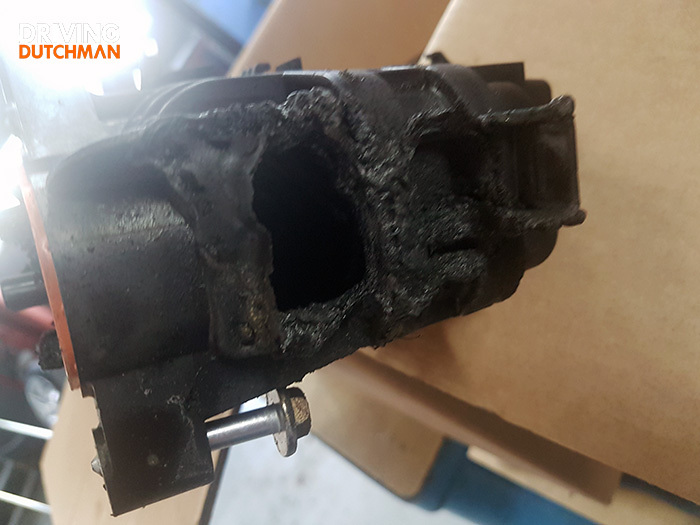 This turned out to be internal all the way to its fully closed from hardened sludge with a thick layer of cabbage, a current and well-known phenomenon, not only at BMW. The koollaag caused by the operation of the EGR valve, the driving of short distances and a … uhh … sedate driving style, which is now known. Less well known is the fact that the carbon around the valves will begin to glow, which is responsible for so-called misfire, which is an uncontrolled combustion means. The hot coal ignites spontaneously, in the injected mixture on a moment, so as the intake valves open and the exhaust valve are still closed. Actually find the fire place in the intake manifold, but the resulting overpressure and the associated heat is not sufficient to be drained and will the intake manifold eventually start to melt. It could even be in a fire get, which the occupants of these X3 notice. The damage turned out to be, and after the refresh of the intake manifold, the wiring of the glow plugs, and a number of vacuümleidingen, turned out to be the car out on the road again. The abundance of agri-environmental measures have ensured that everything past the exhaust came out and now preserved in the engine, and we will know, ask all the affected drivers, among others, BMW, VAG and PSA vehicles.